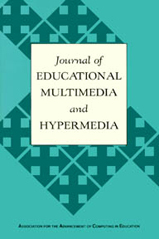 # 1 Journal Ranking in “Education and Multimedia” (H-Index). JEMH is designed to provide a multi-disciplinary forum to present and discuss research, development and applications of multimedia and hypermedia in education. The main goal of the Journal is to contribute to the advancement of the theory and practice of learning and teaching using these powerful and promising technological tools that allow the integration of images, sound, text, and data. JEMH is the official journal of the the Association for the Advancement of Computing in Education (AACE). Members have free, online access to all back issues via LearnTechLib–The Learning & Technology Library.